Spring is finally in the air! I’m loving the warmer weather finally! This week I included recipes for Mother’s Day brunch, but if you want more ideas, I have more recipes here. Link to meal plan google doc. Please keep sharing! I use your plans every week! Thank you so much! I’ve just happened on your website today and I’m SO excited to try out your meal plans! I’ve just found your meal plans. Please please keep posting them. So very helpful. I just had a Protein, Egg and Quinoa Salad Jar for lunch and it was so good! 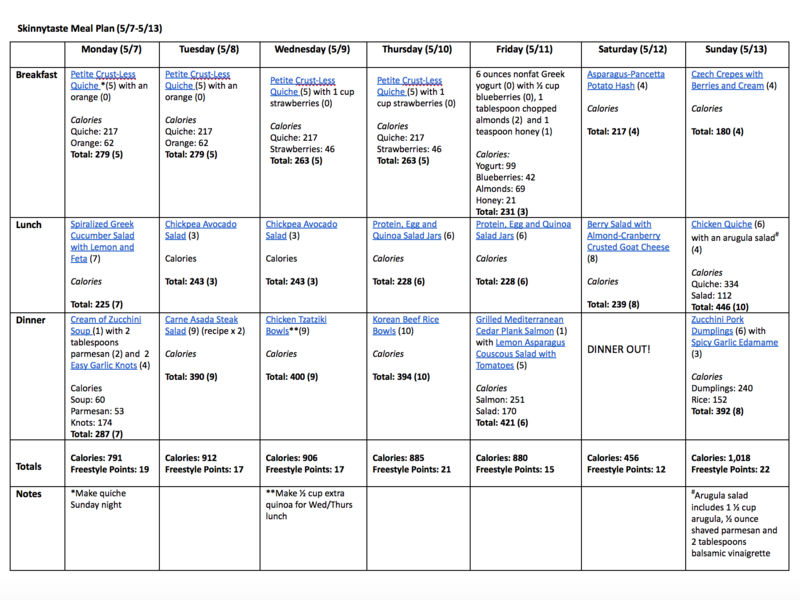 I can’t thank U enough for these weekly meal plans! they are beyond helpful for eating DELICIOUS, clean , healthy, meals easily. I never enjoyed cooking before this, now I truly enjoy cooking stress free, it’s a great way to decompress and release the stress of the day. THANK U! Hello, I have made different recipes found on your website on and off for a while. 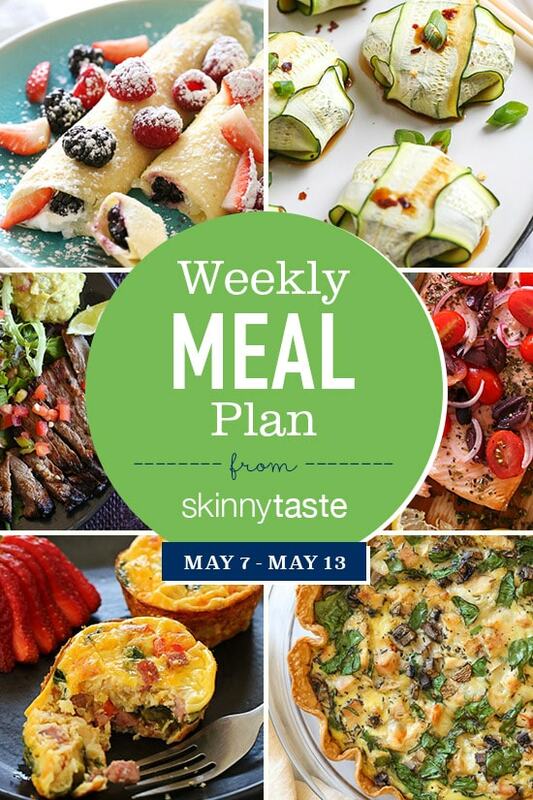 I visited your site this AM to look for a new recipe or two and found your weekly meal plan. I am definitely going to try it out starting the next day or two. The first thing that struck me was the variety of food I would eat that I might not otherwise. I was surprised by the low number of calories for an entire days worth of eating. I am 6 ft, 160 lbs, my interest is to stay that way and eat better more heathful foods that are actually tasty. I like that many of the recipes are single serving. Gina, you are my new go-to for meal planning. I live alone and cook for an army then eat the same thing all week long. Something needs to change. I can’t tell you how much I appreciate knowing your recipes and meal planning ideas are out there. I’ve decided to start with 2-3 recipes this week and slowly add to it. I use your recipes a great deal and lost 25 pounds in WW with your help! I can’t say that I use the weekly menus, but always look them over to find the next recipe I want to try!! I’ve purchased both your cookbooks and eagerly await your next – thank you! I love using the meals plans they help me eat good food as well as try new things and maintain a healthy lifestyle. Yes keep them coming !! Just found your site and Facebook page and will be starting our “healthy eating” weight-loss this week. The meal-plans make it easy – PLEASE continue to publish! Life is already so hectic and stressful (how we ended up fat 🙁 that having delicious meals, with easy peasy planing greatly reduces the stress of how to figure out healthy & tasty meals =priceless! Thank you! I have really been enjoying and appreciating these meal plans! I am a busy mom of four, and we try to eat healthy most of the time, but I have really been struggling with meal planning and making a grocery list. I love your plans and I’m so thankful for the work you put into them. Just a quick question, when calculating points and calories, what is the typical serving size you use to calculate this? For example, I made your yogurt chocolate chip muffins from last weeks plan, and I was not sure how many muffins to eat for that calorie amount. I love the meal plans, while I don’t follow the whole week, they give me inspiration and remind me to keep healthy. Printed four of your recipes to make this week, Thank you!! These meal plans are great! Thank You! Thank you, Gina. I’ve done meal planning for several years. But sometimes I just feel burned out by the process and sometimes I’m just bored. Your meal plans will help us continue to stay in track to that healthy lifestyle we are trying to achieve and maintain. Yours were some of the first books I went to when we made our changes. They are fantastic!!! I have got to be the worst when it comes to meal planning and it’s something I’ve been struggling with for years. Your plan is really going to help me out. Thanks so much! Again, it is different for everyone, which is why I provided the link to the calculator from the USDA to determine what is right for you. I love your menus so much! Every time I read though them I think of all the effort and time you gave. They are very much appreciated. Thank you! You are a lifesaver with these! Thank you so much for all.of the work.you put in to make these available for us. I love this week’s meal plan! I just started using them and have found they really help with meal planning. Thank you Gina! I just started WW, and your meal plans have been key to my success and excitement for the program. I am planning on using a gift card to order your cookbook. Thank you for all of your hard work. Can’t wait to make more of your delicious recipes. Thank you so much for posting these weekly menus. It helps tremendously with our meal planning! I love the variety and flexibility of the plans. We started Weight Watchers at the beginning of the year and it has really helped us jumpstart our healthy eating lifestyle! I appreciate all the effort you put into creating these plans. It makes meal planning and prepping a breeze! Thanks again!! This is AMAZING and I love you for doing this. My intention is to cook more and eat more whole foods…but I am so overwhelmed with meal planning! This is EXACTLY what I needed!